We™ve heard it time and time again how pho­tog­ra­phy œis all about The Light. And of course this maxim is true; no light equals no pho­to­graph. The prob­lem new­bie and ama­teur pho­tog­ra­phers have is fig­ur­ing out the dif­fer­ence between good light and bad light. This arti­cle will attempt to illu­mi­nate (wink) the difference. In truth there is no such thing as bad light. You can achieve GREAT pho­tog­ra­phy with any light so long as that light suits the mood of the pho­to­graph. High noon is a great exam­ple. Most por­trait pho­tog­ra­phers avoid high noon light because the sun casts dark shad­ows under the subject™s eyes. The light dur­ing this part of the day is very harsh and por­trait pho­tog­ra­phers tend to pre­fer softer light. That said let™s say you are try­ing to get that effect for some rea­son. You want your subject™s eyes to be dark because it looks more dra­matic and suits the final result; well then in this case high noon rocks! In terms of safe, soft and beau­ti­ful light where you don™t want to think too much, the golden hour is a great time to shoot. The golden hour is the last hour before the sun sets and the first hour after sun­rise. It™s called the golden hour because the sun is at a lower angle so it™s less intense and cre­ates softer shad­ows. To make this easy, this is what the aver­age pho­tog­ra­pher (pro or ama­teur) usu­ally wants. Sim­i­larly, plac­ing a model under a shady tree is gen­er­ally safe for the aver­age por­trait ses­sion because there too, the light is softer. Still con­fused, here comes the spoon. Softer light makes you squint less than hard light. Softer light is more dif­fused than hard light. The sun straight on a face is hard. The sun com­ing through clouds is much softer. Direct light com­ing in through a win­dow is hard. Light com­ing through that same win­dow with the cur­tains drawn is much softer. 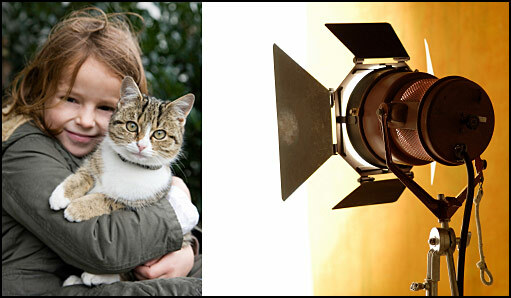 The direct flash of a stu­dio light or a portable flash is hard. That same light bounced off a white wall, dif­fused through a soft­box or bounced into an umbrella is much softer. This brings us to the ques­tion, is hard light bad? The answer of course is no. Let™s say you want to cre­ate a very dra­matic one light por­trait with crisper, harsher, deeper, blacker shad­ows then what are you going to use; hard light of course. If you are in the stu­dio some of your lights may be softer, but your back­ground light may be hard and some of the accent light may be hard as well in order to get crisper more spec­u­lar light in spe­cific areas of the pho­to­graph. A fash­ion model with great skin and a great makup artist can often han­dle a harsher light and these types of shots often look very crisp. Some­thing worth not­ing in this dig­i­tal age is that cur­rently dig­i­tal sen­sors can han­dle less of a range in light (from dark tones to light tones) than older film cam­eras. In prac­ti­cal terms this means that you are more likely to blow out (overexpose/clip) the whitest parts of the scene and this is bad because once the white parts are clipped there is no easy way to get them back and you™ll have to resort to ˜tricks™ to sal­vage the photo. This sce­nario will rarely work out as well as if the scene had been shot in a reduced bright­ness range. Prac­ti­cally speak­ing in por­trait pho­tog­ra­phy, if the model is under a shaded tree, all the tones will repro­duce will because you™re in the shade it™s not so bright. Take the model out into the sun in the mid­dle of the day and your cam­era will likely be unable to suc­cess­fully cap­ture the entire bright­ness range of the scene you are shooting. At the end of the day it makes good sense to get aquainted with as many dif­fer­ent qual­i­ties of light as pos­si­ble as one day you™ll likely need a dif­fer­ent qual­ity of light for a par­tic­u­lar shot.